At the 2004 46th Annual Eugene V. Debs - Norman Thomas - Michael Harrington Dinner in Chicago, Illinois Congresswomen Jan Schakowsky tells the story of a meeting in Washington with US president George Bush. The Congressional Black Caucus had demanded a meeting with President Bush to discuss the situation in Haiti. Schakowsky had also been invited because of her strong interest in the issue. Bush finally, at the insistence of caucus members, made it to this meeting and spent enough time to display his ignorance of the issue. He noticed Jan, a lone white face, and seemed to "jump back" when he saw her button. Osama? No, Mr. President. Barack Obama, and you'll be hearing from him when he becomes the Senator form Illinois. Jan Schakowsky loyally supported Barack Obama in his 2004 US Senate bid and continues to be one of his most ardent supporters today. Schakowsky does every thing she can to help her hero, from organising phone banks in Obama's Chicago HQ to praising his anti-Iraq war stance on Youtube. Schakowsky has been outspoken in her opposition to the Iraq War. She was one of the earliest and most emphatic supporters of U.S. Senator Barack Obama prior to his victory in the 2004 Illinois Democratic primary election, and is actively supporting his bid for the 2008 Democratic presidential nomination. The purpose of this series is to show that Barack Obama is no moderate. He comes from and is supported by the far left of the Democratic Party and their Marxist allies in Democratic Socialists of America. Schakowsky is one of the most liberal members of Congress, and one of the most (by some accounts, the most) liberal members of the Illinois delegation. She is a member of the Congressional Progressive Caucus. She frequently gains ratings of between 90 and 100 from liberal and progressive interest groups and ratings in the low single digits from conservative groups. Jan Schakowsky is an influential politician and knows how to trade favour for favour. She is close to Speaker of the House, Nancy Pelosi. Schakowsky is a close ally of fellow Progressive Caucus member Nancy Pelosi and was an early backer of the San Francisco Congresswoman's successful bid to become House Minority Leader. Pelosi rewarded Schakowsky with the powerful position of Chief Deputy Minority Whip and a seat on the Democratic Steering Committee that decides which committee assignments go to each House Democrat. Schakowsky sits on the Energy & Commerce Committee and is ranking member of its Trade & Consumer Protection Subcommittee. The Congressional Progressive Caucus-the more than 70 leftist US Congressmen and women was partially organised by Democratic Socialists of America. Jan Schakowsky has been moving in socialist circles since at least the '70s. She was then recruited to help with the famous Chicago grape boycott by a young Farm Workers union leader named Eliseo Medina. A lifelong socialist, Medina is today executive vice president of the Service Employees International Union, an honorary chair of Democratic Socialists of America and a supporter of the Communist Party USA newspaper, People's Weekly World. Medina and Schakowsky crossed paths again at the 2004 Debs-Thomas-Harrington Dinner mentioned above. Organised by the Democratic Socialists of America, the annual dinner is a major annual gathering of Chicago's Marxist left-many of whom are Barack Obama supporters. Eliseo Medina was honoured for his union work at the dinner while Jan Schakowsky was keynote speaker. Carl Shier introduced the second honoree, SEIU Executive Vice President Eliseo Medina. Shier first met Medina when Medina was a young man sent to Chicago by Cesar Chavez to organize the UFW's grape boycott in Chicago on $5 dollars a week. Medina worked miracles (including roping young suburban women like Jan Schakowsky into the effort). Neither Medina or Schakowsky were strangers to the Debs Dinner socialist set. 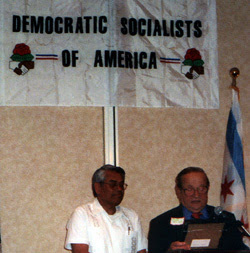 Eliseo Medina attended the 1975 Dinner while in chicago organising the grape boycott. Jan Schakowsky was herself honored at at the May 2005 Dinner for her work in Congress and the community. Schakowsky in 2004 co-sponsored a bill to ease trade restrictions against the Communist dictatorship in Cuba. In 2002 Schakowsky joined 44 other members of Congress, all but two of whom were Democrats, in signing a letter to Secretary of State Colin Powell alleging human rights violations by the Government of Colombia in its war against the drug-running guerrilla terrorist Colombian Revolutionary Armed Forces, FARC, established as the military wing of the Colombian Communist Party. This letter, published worldwide and used as pro-FARC anti-Government of Colombia propaganda, made no mention of FARC's thousands of murders, atrocities and support from Fidel Castro and from Venezuela's Marxist caudillo Hugo Chavez. The letter urged Secretary Powell "to take our concerns into account when determining whether to approve additional military aid for Colombia this year." Like most leftwing members of Congress, Schakowsky voted against the use of force in Iraq but also against allowing oil drilling on a scant 20 acres of the 1.2 million acre Arctic National Wildlife Refuge (ANWR), thus voting to keep America dependent on Middle Eastern oil while opposing efforts to make that region politically democratic and stable. Nearly 60 percent of Schakowsky's Political Action Committee (PAC) contributions come from organized labor. Among her biggest individual donors are the Teamsters Union, public employee unions such as the American Federation of State, County and Municipal Employees (AFSCME) and the Service Employees International Union (SEIU), the Association of Trial Lawyers of America (ATLA), and the AFL-CIO, whose President John Sweeney is a card-carrying member of Democratic Socialists of America. Nancy Pelosi gave Jan Schakowsky some powerful positions in return for her support. If Jan Schakowsky wasn't a Congresswoman, she'd probably struggle to get a security clearance to clean latrines at any US military base. What high position might president Barack Obama give his loyal supporter Jan Schakowsky? Whatever it might be, you can bet Schakowsky and Obama's Chicago socialist friends will be very happy. This is a truly hilarious series. The author clearly knows very little about American politics or the American labor movement but still feels quite sure that his sweaty-palmed little web research spree is right on target. Aside from the fact that Obama is a careerist corporate politician par excellance--and very much the mirror image of Bill and Hillary Clinton--the author has done nothing more than expose how weak the (in this case tepid reformist) American left is here. There are certainly a few left parties that run candidates, but aside from the Greens (most of whom are not Marxists, but disaffected Democrats), none of the socialist parliamentary formations have run a credible national candidate since the late 1940s. Democratic Socialists of America are a bunch of mild-mannered middle-class college professors who wouldn't make a revolution if someone gave them an army and handed them the keys to the treasury. It has a few thousand members, but only on paper. The Communist Party has been tailing after the Democratic Party for decades and is not even a shadow of its militant past. It has maybe a couple of thousand members. In a country of 300,000,000. Unions like AFSCME and SEIU are no more socialist that the author is, they are primarily what we call "business unions" with a thin veneer of "social justice speak" over their ready willingness to sell workers out to the bosses. So, fear not, it's going to take the American left a long time to even get minor reforms like the kind of universal health that countries like Australia or Canada have, and by that time the U.S. will be broke, and will have taken the global economy down the tubes with us. We'll see how many of you libertarians keep your teenage ideology once you're all unemployed. Oh, and since you're a libertarian, please answer the following question. . .how do you plan to get around after the libertarian revolution when there are no public highways? It's going to be a bit tricky for each non-citizen to keep up the toll booths on their own stretch of "private road," let alone pay all the tolls, eh? Coming soon. . .libertarian civil war. . .the war of all against all. . .enjoy! Whose father had a high-ranking position within the Egyptian Communist Party is now Obama's advisor? Robert Maller was also behind the failed Camp David meeting during his time in the Clinton Administration, and now someone like this is advising a major political campaign? Well, mah29001, I wonder what your question has to do with anything I just said? "(Ezekiel 18:20) - The person who sins will die. The son will not bear the punishment for the father’s iniquity, nor will the father bear the punishment for the son’s iniquity; the righteousness of the righteous will be upon himself, and the wickedness of the wicked will be upon himself." You lot seem to think Communism is some kind of disease as opposed to a section of the political spectrum. So the dad had the disease, therefore, his kid gets it? Not a helpful way to look at politics. . .particularly since many a right-winger on the planet is a red-diaper baby. Including quite a few (right) libertarians, one imagines. "You lot seem to think Communism is some kind of disease as opposed to a section of the political spectrum." Uh, didn't Marx himself outline the sort of description for his followers to take control and overthrow the original state? Didn't you miss his ten plakes or something like that? That hardly makes Communism anything other than a political ideology. If overthrowing states qualified as a disease symptom, then most political ideologies (aside from maybe Christian Anarchism or some such) are diseases as well. Libertarianism included since "slashing government to the bone," as this site's host so casually puts it, is tantamount to overthrowing said government. I'll see you a bacterium and raise you a virus. . .
Interestingly deceptive comments by mr. comrade. Re: the "mild-mannered college professors" in DSA, Bill Ayers and Bernadine Dohrn would hardly be considered "mild mannered." Yet, according to the "New Party" archive, they, and Obama, were engaged in New Party activity from 1996; Obama signed a "contract" with them so they would assist him in his election efforts. Re: the "business union", SEIU, see Steve Diamond's blog: globallabor.blogspot.com. A business, only if their business is thuggery and intimidation. Nice try, but disingenuousness won't work. If the DSA is as ineffectual as you claim, how is they managed to field a competitive candidate for the presidency, below the radar, of course? These people are top down, authoritarian left. This isn't a garden party, mr. comrade. Forward Socialist Youth -to Belarus 2009! Hone Harawira and "Thoughts of Violence"